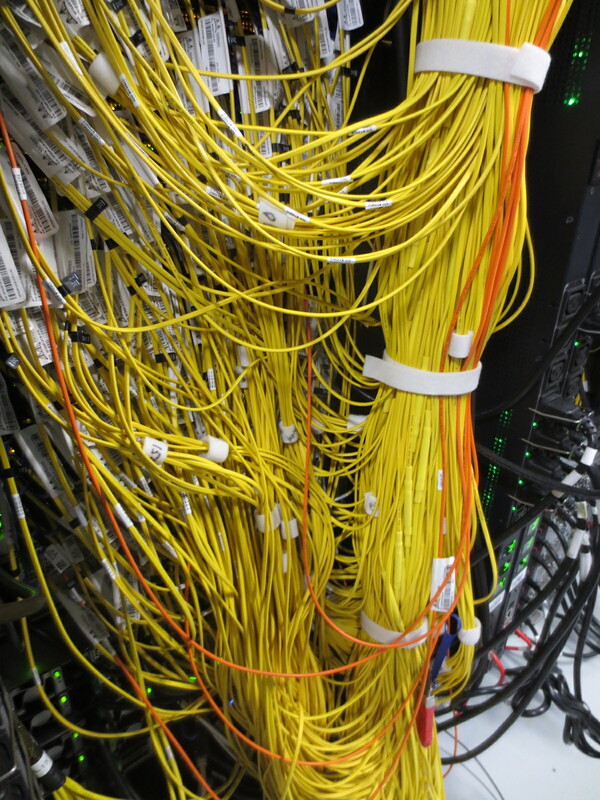 The University of Michigan Network (UMnet) has a backbone of multiple 100 Gigabit Ethernet (GbE) links between campuses and provides multiple 1GbE or 10GbE links to buildings. For a description and diagram of the campus backbone, see itcom.itd.umich.edu/backbone/. For information about acquiring a 10GbE connection, visit itcom.itd.umich.edu/backbone/10gbe. ARC-TS has launched a new initiative aimed at facilitating uninterrupted data flow to meet the needs of researchers across campus. Faculty and researchers experiencing problems with data flow to or from their labs or offices can contact ARC-TS by filling out this short questionnaire; ARC-TS staff will work with researchers to identify the causes of networking bottlenecks, and will implement the appropriate solutions. The initiative includes resources for upgrades to network connections between labs and offices and the U-M campuswide network backbone, if that portion of the network is determined to be the cause of a data flow slowdown. As many as 200 labs and offices on campus may be upgraded to either 10Gbps or 40Gbps connections to the campus backbone. U-M employs a Science DMZ (demilitarized zone) designed to optimize network performance for research applications by removing obstacles that traditional networks place on data transfer and other functions. The U-M Science DMZ is based on a design from the U.S. Department of Energy’s Energy Sciences Network (ESnet). See ESnet’s Science DMZ page for more information. Visit the U-M Science DMZ page for more details on the U-M system. For consultation on whether the DMZ would be useful for your research, and how to connect, contact hpc-support@umich.edu. UMnet has two 10GbE connections to the Merit Network, the state’s network, for commodity or general Internet traffic. Merit has multiple 10GE connections to Chicago and Cleveland, with multiple 10GE peerings with other research networks such as Internet2, ESnet and CIC OmniPOP. Michigan Lambda Rail (MiLR) (pronounced “MY-lar”) is a very high-speed, special purpose, data network built jointly by the University of Michigan, Michigan State University, and Wayne State University, and operated by Merit. MiLR provides campus researchers low-cost, 10GE connections between the three university campuses and to national and international research and education (R&E) connection points. It provides the University a 100Gb connection to Internet2 in Chicago. in Chicago, where the Internet2 and the Energy Sciences Network (ESnet) POPs are located at 600 W. Chicago. In addition to general purpose connections, U-M researchers have four 10GEs from U-M’s Ann Arbor campus to Chicago over MiLR that are used for research-specific traffic. They are currently used for large data set transfers for LHC Atlas Tier2 project and uncompressed high definition video collaboration for the School of Information. The MiLR equipment will support 40 and 100 GbE connections. This technology provides great potential for additional connections that will position the university for future CI opportunities. U-M also has a connection to the DYNES Project (Internet2 ION service) for dynamic circuits to participating research institutions. This service has been driven by the Atlas Tier2 project, but will be available to all researchers on campus. For additional information about network resources at U-M, contact the ITS Communication Network Architects Group at itscommna@umich.edu.